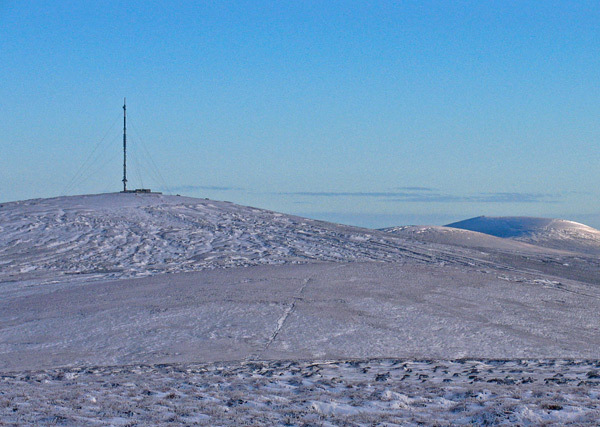 Kippure is the highest and most southerly summit in Dublin. 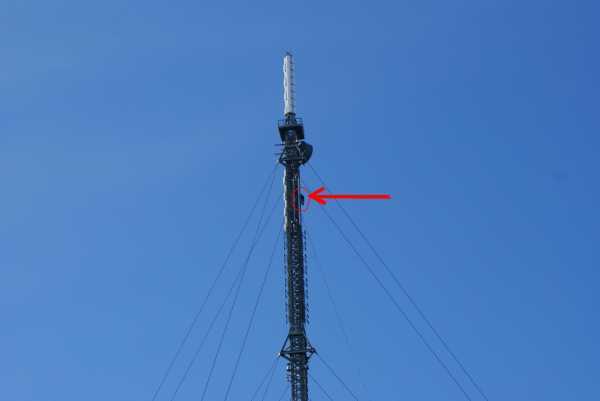 It is crowned by a 110 metre high transmitter, and is approachable from all points of the compass. It can be walked on its own or as a route combining several other local summits. Most routes involve heavy, open bog, while one approach makes use of a gated access road. The summit is urbanised and ugly, but the views on a good day are expansive in all directions, taking in Dublin, Bray, the Irish Sea and many of the Wicklow hills all around. 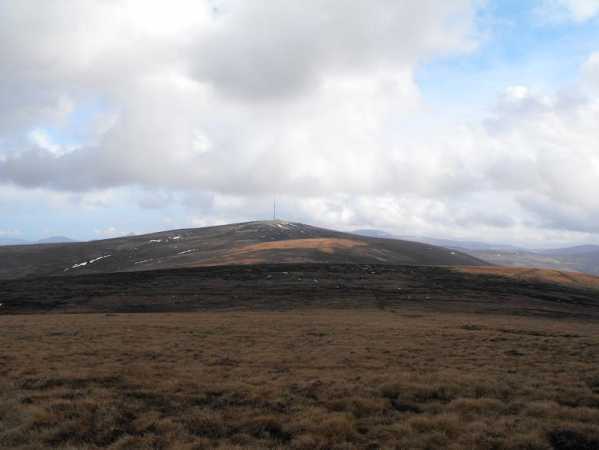 North, an approach through Glenasmole is possible from O109 199 A, or from a bog track at O131 198 B. East, the adventurous can start at the cottage at Lough Bray Lower at O142 164 C and head up the steep ground between the two lakes. Otherwise park at O143 153 D and follow a track that skirts the corrie walls. The gated access road at O141 142 E is the most popular with the Sunday stroller. South, typical approaches are from O137 137 F, or from O080145 G, both of which cross heavy bog on the way up. West, start at O063 169 H and take in Seefin and Seefingan en route. North West, start at O073200 I and take in Seahan, Corrig and Seefingan en route. I would like to add a few details to Wicklore’s comment on walking around Lough Bray (Upper and Lower), which may add to the interest of exploring this area. The massive outcrop between the two corries is known as the Eagles’ Crag (although the name does not appear in the OSI map). It is recorded that eagles did, in fact, breed here into the 19th century, when they were finally hunted to extermination. It still isn’t unusual to see a peregrine falcon or kestrel rising on the thermals created by the corries, but you are just as likely to see today colourful paragliders doing the same when the weather is favourable. 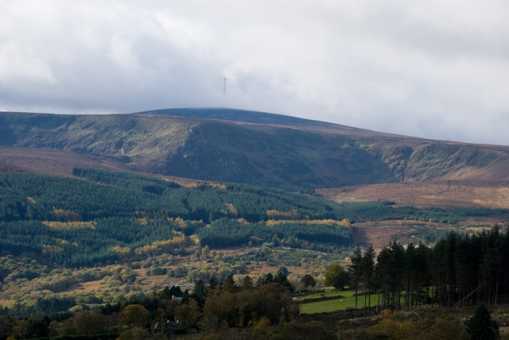 The corries themselves were formed during the last Ice Age and marked the head of a glacier that flowed down the length of Glencree Valley, with, I would surmise, minor tributaries coming from Raven’s Rock glen (east of Lugduff) and the little glen at Powerscourt Waterfall, each of which has its own modest cirque. The lakes that formed behind the moraines are quite deep and do not seem to communicate above ground, which has led to speculation that they may nonetheless be connected underground, with a flow from the Upper to the Lower. The water is acidic and low in nutrients, so aquatic life is rather poor and you will see that waterfowl are infrequent visitors. I read once that whooper swans have been known to descend here in winter, but I have never myself seen their white beauty on these black waters, despite many a visit. There is abundant plant life around the corries, I am assured, but the names that leave some botanising friends of mine ecstatic, like woodrush, cowberry and quillwort, are rather lost on me. 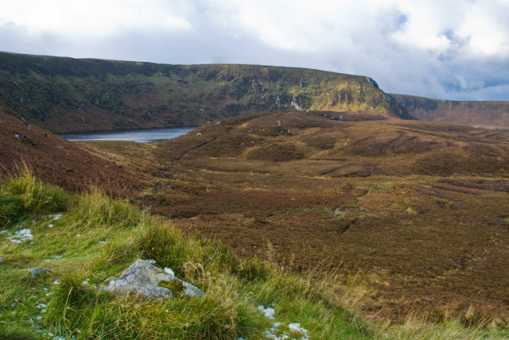 The broad shoulder of Kippure that slopes down to the east drops precipitously into the twin corries of Lough Bray Upper and Lough Bray Lower, separated by the blunt wedge of the Eagle’s Crag (see photo). The walk around the rim, above the brooding lakes, has plenty to grip the attention, but there’s also a literary association that gives added interest to any walker’s visit to this area of rugged beauty. 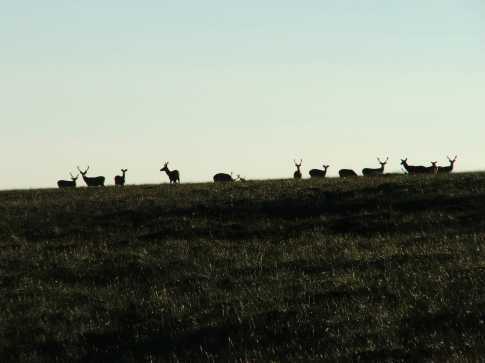 Picture from SDillmore : The deer aren't as interested in me as I am in them. Picture: The deer aren't as interested in me as I am in them. Picture from Homerclesse : Kippure across the Boggy Athdown Pass. Picture: Kippure across the Boggy Athdown Pass. I've approached the summit a few times by two alternative routes. The first is a straight up down route following the tarmac road from the gates off the Military Road. Although a rewarding view awaits it's not the most inspiring route and a little obvious. The second route is by a couple of approaches. Park at the gates of the Kippure Estate and follow the track across the road. This eventually leads into heavy forest with a lot of deeply rutted tracks and felled trees. The best option is to head to the river bank (Athdown Brook) and climb up along the left side bank of it. A nice view behind you to the Coronation Plantation and the Mullaghcleevaun Range. Once you clear the line of trees on the left then it's simply a matter of climbing up to the top of Seefingan with it's mighty Cairn. Great views of the Blessington Lakes, the other hills of the West Wicklow range, south to Mullaghcleevaun and east to Kippure, our destination. It's very hard to miss with it's huge Aerial on top. Head out across the boggy Athdown pass and follow a line up to the top of Kippure. Being the highest point in County Dublin you will be rewarded with amazing views on a clear day. All the major summits are visable. It's a very boggy approach in places but very challenging. Head back down roughly 220 degrees to the bridge on the Sally Gap and back to the car along the Road. Picture from Dessie1 : Highest man in Dublin!! Picture: Highest man in Dublin!! Hiked up Kippure on 21-5-10.Parked in the car park at the small bridge (O1094912774 J) just where the R759 road passes over a small stream.Hike length to top was 2.7Km.Took a 14 deg true bearing all the way to top.